Contact the Beacon Isle Hotel Plettenberg Bay. Plettenberg Bay another of South Africa's prime holiday destinations, is one of the most beautiful places along the Garden Route. It has recently been discovered that during the ice age between 12000 and 18000 years ago the sea was about 80 kilometres south of where it is today. The Robberg Peninsula which forms the western boundary of Plettenberg Bay used to be surrounded by grasslands and was grazed by giant wildebeest, kwaggas and ostriches to mention but a few. The rocky outcrop today known as the Robberg Peninsula was inhabited by the Khoisan in those times who hunted the animals on the plains and gathered roots and plants for their survival. As the ice melted the water eventually flooded the grassy plains and formed what is to day known as Plettenberg Bay. The rocky outcrop on the coastline in the centre of the bay is known as the Beacon Island. It apparently received its name from a stinkwood navigational beacon that was set up on it in 1772 that was used by mariners to set their chronometers. The beacon had to be renewed on two occasions during the 19th century. Beacon Island is not an island in the true sense of the word. It just happens to be situated in the estuary of the Piesang River which separates it from the land. Today it is no longer an island as the western bank of the river has been filled in to provide access to the island and the hotel. Not much was known of the island before John Sinclair started his whaling activities in the bay. The first cargo of whale oil left the shores of Plettenberg Bay in 1834 on board a ship named Calypso. After Sinclair a number of other men continued to whale in the bay and it was Cornelius Watson and Percy Toplis who managed to obtain a lease to use Beacon Island as a whaling station. Tragedy was to strike Watson shortly afterwards when a whale he had harpooned from his boat Scorpion dived and pulled his boat under. He was drowned and a week later the whale with Watson's harpoon still in its side washed up on the beaches near Cape Town about 500 kilometres away. Watson's partner struggled on and eventually sold out to the Southern Whaling Company in 1908. Whaling continued from the Beacon Isle until 1913 when a Norwegian company with seven whaling ships started whaling in the bay. Things went well for a couple of months and then ill luck started to take its toll. The whaler Groukama sank in the Knysna lagoon at Featherbed Bay. A month or two later the pilot boat used in the lagoon was capsized by the Thesens supply boat. In July 1914 the whaling station on Beacon Island was badly damaged by fire and to crown it all war broke out in August of the same year. Whaling however continued until 1916 when all operations ceased. Today there is not much left of the old whaling station although the old slipway can still be seen. Of course this island setting could not stay uninhabited for too long. With whaling being a thing of the past the manager's house on the island was soon turned into a boarding house and was run by Anne Harriet and her husband Thomas Hopwood. This tradition has been continued till today with the building of the splendid Beacon Isle Hotel on the rocky outcrop. The hotel has become a famous landmark with its postion in the centre of the bay. It can be seen from Robberg and from as far as the Keurboomsstrand which is about seven or eight kilometres up the coast towards the east. Beacon Isle hotel is very popular and caters for families, newly weds and international tourists as well. 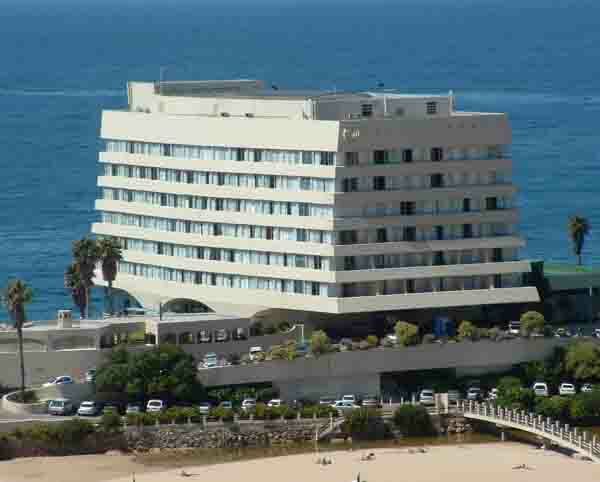 The hotel overlooks what was once Plettenberg Bay's harbour, the bay situated at the mouth of the Piesang River. Today it is used as an anchorage for the squid boats that launch from the beach between Beacon Isle and the Lookout rocks a 100 metres or so across the bay. This whole area is spectacularly beautiful and is well worth a visit. Why not visit Plettenberg Bay on your next trip to South Africa.